Holy Trinity Catholic School is committed to the safety and well-being of our students, educators, and staff. We believe this commitment includes the implementation of programs that involve parents, teachers, support staff, administrators, local law enforcement, mental health & wellness professionals, and elected officials to take meaningful action to protect our students, staff, and community. 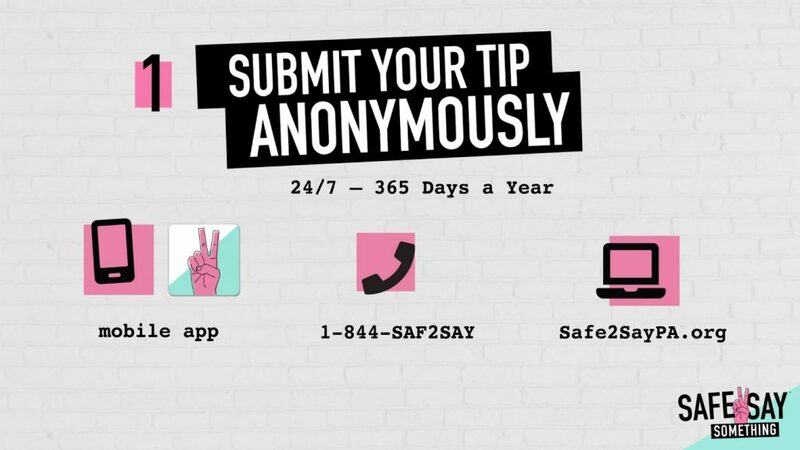 Recently mandated by Pennsylvania State law, S2SS is an anonymous reporting system designed to help students and staff to recognize the warning signs and signals (especially on social media) of individuals who may be a threat to themselves or others. The S2SS program trains students and school staff members to treat every warning sign seriously and to act quickly to get help by talking to a trusted adult and/or by reporting it anonymously via phone, mobile app, or website to the Pennsylvania S2SS Crisis Center.